Hayley's performance(s) as a guest artist on (part of) this cruise is now confirmed by Bandana but there probably won't be a general announcement as it's considered to be similar to a private event. I've amended the thread title accordingly. I would be astonished if Saga do not promote Hayley's appearance on their cruise website in order to boost the cruise sales. P & O did for Katherine Jenkins cruises later this year. Bandana saying that it is a "private event" is also surprising since the cruise passengers are members of the public! That's why they said "similar to" a private event. I think they will just leave it to Saga to promote, and I am sure Saga will do that. 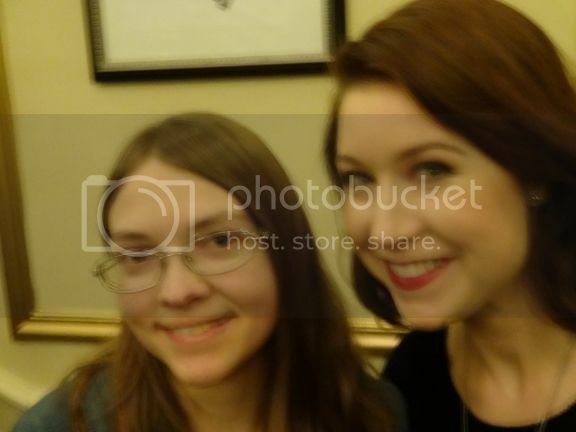 Soprano Hayley Westenra will be joining Saga Pearl II Adriatic Homecoming cruise on November 22. New Zealand-born Hayley has sold more than four million albums worldwide - her first No 1 album, Pure, became the fastest selling debut album in UK classical chart history. Hayley, 26, is a Royal favourite and has sung for the Queen on four occasions as well as appearing in the Royal Variety Performance. Sleep On, dedicated to Prince William’s baby, is featured in her latest album, Hushabye. Joining Hayley on this melodic cruise will be The Operababes, The Gondolier Trio and the Venetian Three Tenors. Passengers will also enjoy a Venetian masked ball and Venetian dinner on Saga Pearl II. The 24-night all-inclusive cruise also includes the opportunity to visit the ancient ruins of Cartagena, Gaudi’s Sagrada Familia in Barcelona, mythical Corfu, historic Split and, of course, the beautiful city of Venice. Saga Pearl II's return to Classic Cruising starts from £2749 for 24 nights which includes travel to and from Southampton, travel insurance and cancellation cover, all meals and house drinks, room service, welcome cocktail party and Captain’s dinner, all entertainment and activities and all gratuities. So, Dave, are you still planning to view the send-off on Friday? A smart move on Hayley's part. As the saying goes, best to start at the bottom and work your way up. I doubt she makes many of her own concert arrangements. Click on the image for an even bigger enlargement. I will try but am expecting visitors soon after it's due to depart so I'm not yet sure if I can get there and back in time but I will try. Currently it's shown as a blue diamond near to Mayflower Park, zoom in if necessary and click the "Ship Names" box. If the site is slow, there are plenty of other ship tracking websites too. The ship will head slowly SE down Southampton Water then round the East side of the Isle of Wight before turning Westwards into the English Channel, all that takes about an hour ot more. Neat trick of yours to make the picture of the ships so large. 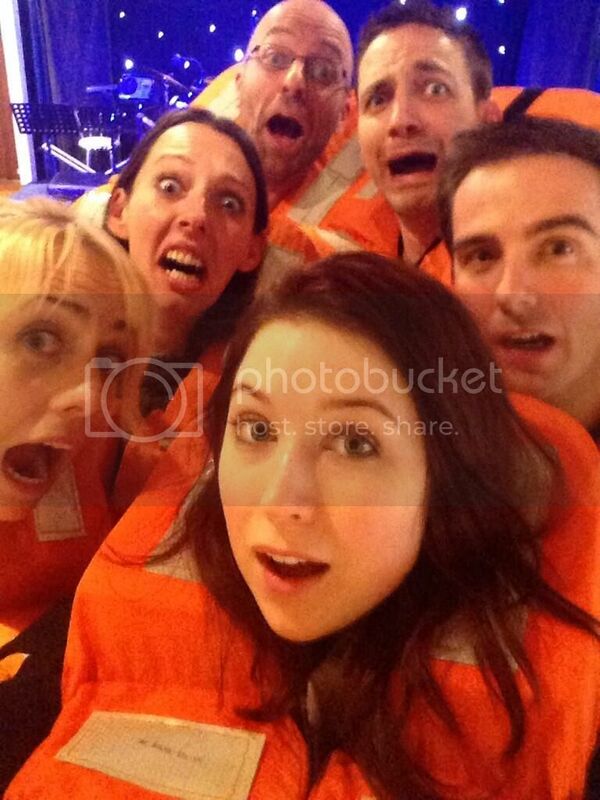 Hayley Will have a familiar companion on the Cruise. Lets hope they get some good weather. Looks like the're all at sea. Karenza and Tim have both re-posted the photo. I hope they have given Hayley a comfortable midships (Less Movement) cabin. After four months without a break it begins to feel like a prison, even if I had the handiest job onboard. Thanks Jim. A priceless photo. The lifeboat drill must have taken them by surprise as the two guys at the back didn't even have time to put their teeth in!